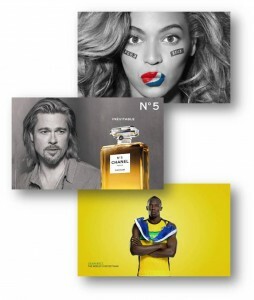 Celebrity Advertising: Pitfalls or Payoffs? In many ways we live in a celebrity driven culture. Whether it be television, movies, music, sports, fashion or politics; star power rules. We read celebrity news, watch them on talk shows or reality television and follow them on twitter. Certainly the stars have cashed in on this national – and international – obsession with celebrity. Some examples – Beyoncé’s $50 million deal with Pepsi, Usain Bolt’s $8.6 million annual contract with Puma and Brad Pitt earning $6.8 million to be the face of Chanel No. 5. But can the interest and loyalty attached to a celebrity be successfully transferred to a brand that pays for an endorsement? Or do jaded consumers dismiss these endorsements as a sell-out by their otherwise adored idols? 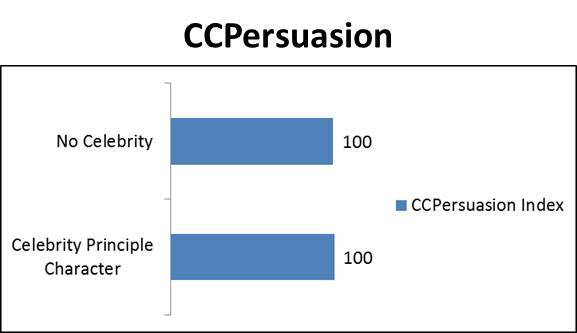 Based on historical results of MSW●ARS television ad testing, in terms of the ability to persuade consumers to choose the brand over competitors, overall, celebrity ads achieve CCPersuasion scores right at parity with the norm. However, when a celebrity ad clicks, the results can be outstanding. In fact, among the top scoring established product ads in the MSW●ARS database, celebrity ads have out-performed non-celebrity ads. 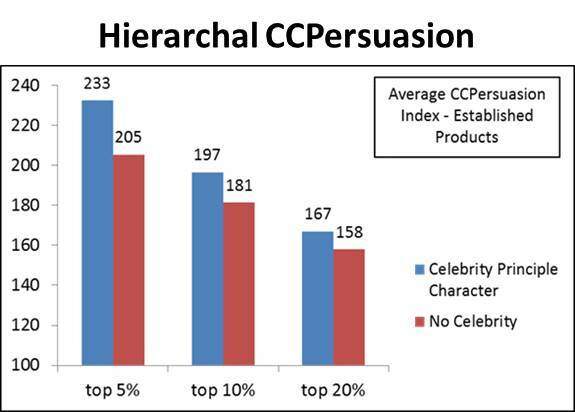 The top 5% of celebrity ads have achieved a CCPersuasion index of 233 versus 205 for the top 5% of non-celebrity ads. 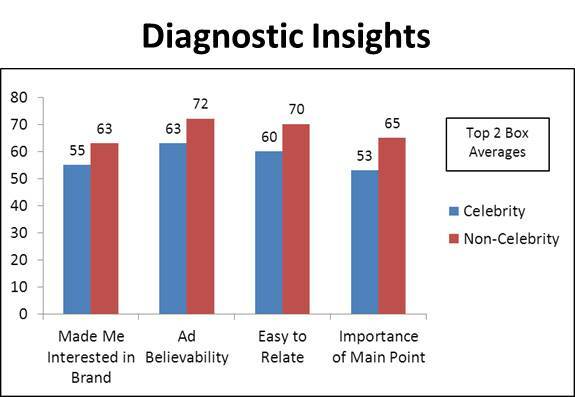 Celebrity ads retain a diminishing advantage in the top 10% and top 20%. Importance of Main Point: Too often a celebrity may be used as a replacement for a compelling proposition. Easy to Relate: Celebrities live in a different world than the rest of us. This presents a challenge in using them to illustrate how a brand will satisfy “our” needs in a way that is relatable. Ad Believability: Consumers may be skeptical that the celebrity actually uses – or has even tried – the product and may also be cynical that the celebrity has been “bought”. Made Me Interested in Brand: This illustrates the challenge of redirecting interest from the celebrity to the brand itself. Two of the most important keys to using celebrities effectively are to ensure an appropriate fit between the celebrity’s reputation and the benefits or claims being made about the advertised product; and ensuring that the presenter does not displace the brand as the key focus of the ad. The following examples illustrate brands that have done this effectively. In the Epic Splits ad for Volvo Trucks, Jean Claude Van Damme describes the years of hard work that has allowed him to attain a “body crafted to perfection”. This harmonizes with Volvo’s reputation for quality, attention to detail and heritage. And the demonstration illustrates not just Van Damme’s amazing flexibility and balance, but also the stability and precision of Volvo’s dynamic steering system. In his endorsement of the MicroTouch One razor, Rick Harrison’s historical expertise on consumer products, not to mention his clean shaven head, makes him a great fit for their television ad. The ad achieves a balanced perspective by keeping the product and its attributes the main focus through ample demonstrations and time on screen. Finally, in this spot from Taylor Swift’s on-going campaign for Cover Girl, she not only portrays beauty but also provides a realistic context for the problem of makeup removal – that is, clean makeup enables “taking off the mask”, a stage performer challenge. To receive a complimentary copy of our full Celebrity White Paper, please contact your MSW●ARS representative.